So I gave you tips on how to take care of your lips before sleeping, now here's another easy advise that would definitely fly far. Lip conditioners help nourish the skin on your lips to battle out any drying effect caused by windburn, sunburn, alcohol or other harsh ingredients on cosmetics and of course bacteria (which is pretty much unavoidable especially if you can't quit the habit of licking your lips--yes, it's not good). Before applying lipstick, use a lip conditioner to prep your lips. It would serve as a primer, like how you apply primer on your eyes and face to improve the color and the lasting effect of your make-up. Conditioning your lips before applying lipstick would result to a smoother application of color and would rid you of chapped lips or cracked lips problems. Lip balms are great for this job! You don't have to shell out extra dough, yey! :) You may use your basic chapstick to condition your lips BUT I would recommend to use a balm that has beeswax. Beeswax is highly recommended for the lips, especially those who have easily dried out lips. Beeswax are deeply moisturizing and are often used on effective lip treatments, check out Burt's Bees line if you wish to treat your lips from windburn--which for me is the most painful lip burn. 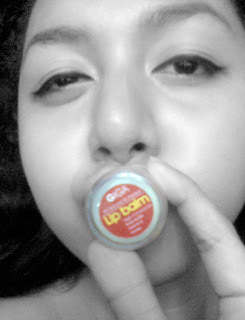 As for me, I recently discovered Giga Ventures' lip balm and am far-thrilled with the results. It's line of ingredients really cares for my lips and my lipsticks perform much much better on top of well-conditioned puckers. You may check out more Giga Ventures products on their website here. Hope you also take time to read my review of their therapeutic "No Pain", a great stress-buster!